1) Are US equities more volatile now than previous cycles and, if so, why? 2) What is a reasonable expectation for volatility in coming years? Pulled the daily returns for the S&P 500 from 1958 (the first full year for the index) to the present. This dataset encompasses just over 15,000 days. Calculated the standard deviation of those daily returns to assess the range of day-to-day price action across a 200-day rolling period (roughly one year of trading days). Ran a 1,000-day rolling average of those standard deviations, to see how volatility has changed on a more structural basis across years and decades. #1. Across the time frame here (1958 to present), US stock price volatility has become increasingly more, well, volatile. From 1962 to 1987, the long run average (1,000 day) standard deviation of returns varied from 0.5% (low levels) to 1.0% (peak levels). After 1987, the high points for historical long run price volatility reached 1.3% (2002) and 1.6% (2011). Low points were in 1996 (0.58%) and 2008 (0.70%). Simply put, US stock price volatility has shown “Higher highs” and “higher lows” from 1987 onwards. The birth of the “Fed put”. Recall that then-Fed Chair Alan Greenspan was quite aggressive in the aftermath of the October 19th market dislocation, assuring markets that the Fed would provide liquidity as needed. That gave rise to a new market belief, namely that the Federal Reserve viewed equity price stability as an unofficial part of its mandate. This may have given rise to incremental risk-taking in equities, and exaggerated the market effects of the normal economic cycles. Technology in trading. The 1980s were the starting point for the current highly automated US equity market structure we have today. Faster access to markets puts new players in the game and may exacerbate market swings if those participants’ views are correlated to the status quo. More derivative products tied to equities. From futures markets to exchange traded funds to listed options, there has been a proliferation of instruments tied to US stocks. Most were introduced or grew to prominence in the 1980s and after. We don’t think any one of these explanations on its own explains the higher levels of volatility after 1987, but in aggregate they feel directionally correct in terms of explaining what the data clearly shows. #3. So what happens going forward? 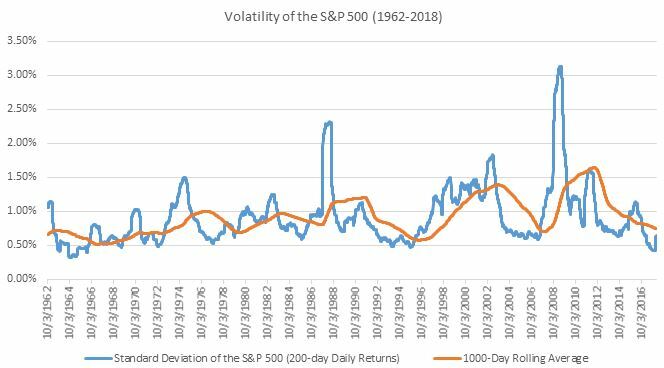 The 1,000 day rolling average of volatility in the chart highlights what you already know: volatility has been exceptionally low for several years. It is also as low as the prior nadir (2008). Last year’s record streak of low volatility was clearly the low for price churn. Since the chart also clearly shows that equity price volatility either rises or falls (rather than remaining static), we conclude that future volatility will rise this year and beyond. Getting back to “normal” US stock price volatility will feel quite “abnormal”. Just to get back to average volatility (a 1.0% standard deviation of returns since 1987) will require 33% more volatility than the last 1,000 days (0.75% standard deviation). The key takeaway here: volatility moves in cycles, and many structural factors shift the amplitude of those waves. We are coming off a low point just now, and should move higher from here. This doesn’t mean US stocks cannot rise in 2018 (we believe they will), but rather that their daily moves will be notably greater than the last few years.